My three picks for a family reunion in the sun are The Palms Hotel & Spa, the Park Central Hotel, and the Trump National Doral; very different resorts that make my family return to Miami, Florida again and again. When it comes to multigenerational travel, it’s hard to beat the universal year-round appeal of Florida, America’s No. 1 tourist destination. From the seashore to the golf course, the Early Bird specials to the salsa clubs, there are activities and entertainment for every age group. Our family, hailing from the Northeast, Southwest and Europe, have reunited to snorkel in the Florida Keys, meet The Mouse, shell on Sanibel, sail off the coast of Naples, play tennis on Longboat Key, shop in Palm Beach, barge through Okeechobee and eat, eat, eat — souvlaki in Tarpon Springs, Derek Jeter sandwiches in Tampa, and Cuban sandwiches in West Palm Beach. But the town that keeps us coming back is Miami. It’s hot and ritzy, chic and trashy, loud and fun, colorful and joyous, risky and cutting edge all rolled into one. With active grandparents and children young or old enough to enjoy the best people-watching and shopping in the state, we say nothing beats Miami as a destination for three generations to reunite, renew their familial ties, and discover each other, one by one. Because there is such a diversity of offerings, three generations of our family decided to test some of Miami’s hottest hotels and decide which appealed to which generation. We examined The Palms, an elegant Euro-chic boutique hotel with low-key sophistication. We revisited the stately Park Central, a 1937 National Historic Landmark that is up to par with larger, faux Deco rivals. And last but not least, we turned to the Trump National Doral, whose 650 acres of gorgeously landscaped golf courses attract the likes of Tiger Woods. In the chaos of the Easter/Passover weekend in South Beach, the Palms in Miami Beach turns out to be an oasis of calm for sophisticated travelers with teenage kids. While thousands of toddlers are water-sliding into wading pools at the Collins Avenue hotels, the teenage set at the Palms is jet skiing along the hotel’s private beachfront. Or, they’re begging their parents for a turn at the elegant Aveda spa. Or, maybe, lunch at Essensia, the cafe fueled by herbs from the chef’s garden. Their parents and grandparents, meanwhile, are stretched out in hammocks under palm-thatched palapas on the sand, with a pina colada and the latest Grisham novel. All around the caged tropical parrots are the many varieties of palms and dune grasses that give this hotel its lush tropical feel. Decorated in SoBe style with wood furnishings cushioned by lush, colorful fabrics, the Palms has elegantly appointed small rooms with good closet and storage space, and attractive bathrooms. Connecting rooms offer one room with a king-size bed and one with two double beds. Other options include single rooms with two double beds, junior suites with a pull-out sofabed and one-bedroom suites. Although it feels far from the bustling Miami Beach mania, with its central location the Palms offers the best of both worlds. Within walking distance of its fan-cooled lobby are funky fashion, couture shops, art galleries, cafes and nightlife venues in and around Lincoln Road, Collins and Washington Avenues. Rates range from $$-$$$. Children under 12 years old stay free with their parents and kids under 12 eat from a kid’s menu at Essensia; baby cribs are available. The pink and blue dowager towering above 6th Street at Ocean Drive is the Park Central, designed by master architect Henry Hohauser in 1937. 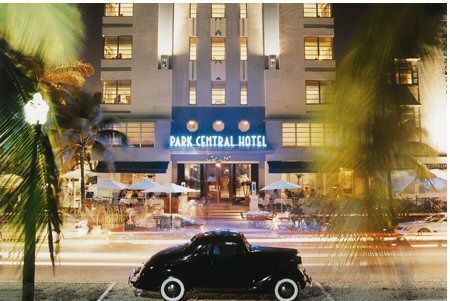 Beautifully restored and elegantly streamlined, this is one of the few authentic Ocean Drive Deco hotels where families are welcome. Let’s be clear, though, that the Park Central’s stylish bar and small, better-seen-than-swum-in pool will appeal more to party-goers and European singles than to raucous kids looking for resort entertainment. But for new parents who long to participate in Sobe’s outdoors café, rollerblading and people-watching scene, it’s a great choice, and the rooms offer romantic views. Currently under renovation which will be done in phases, the interior areas of the resort will be completely renovated and remodeled while keeping the historic facades. Additional suites with balconies and a rooftop glass bottom pool are planned, along with adding a patio and pool to the garden area. There will be a new restaurant and bar, and the rooftop will be transformed into a relaxing retreat. The Park Central is also fun for families with teens, who will enjoy a good measure of freedom. The Park Central is within easy walking distance of Washington Road shops and across the street from the beach, where concessionaires provide chairs, umbrellas, watersports gear and snacks. And, with the vintage 1937 Nash parked out front, they’ll never get lost! Last but not least, it’s a very cool place to stay and be seen. Rates range from $-$$$ per room, depending on view and season. If you’re after laid-back luxury and time to enjoy five championship golf courses and a world class spa while your kids are whisked away, Trump National Doral is the place for you. At our visit a several years ago, we thought it was almost perfect… but we’ve learned that The Donald himself, Mr. Trump, took it over in 2012 and has spent $250 million renovating the over-600-room resort. In our opinion, the only thing missing at here is the beach, but if you can live with the property’s newly remodeled Royal Palm Pool with zero entry and a 125-foot slide, the other amenities more than make up for it. Just 10 minutes from the airport, Trump National Doral is laid out on 800 acres of tropical gardens. In addition to the award-winning tennis center and golf courses, the spa will pamper and rejuvenate you. Room amenities include rainfall shower heads, 55″ flatscreen TVs, balconies or lanais, and marble flooring and baths. The Trump Kids Club offers children 4-12 years activity-filled days focusing on creativity, imagination and adventure. Lots of options, including full or half-days, with and without lunch, and early or late extra hours are available. Activities include pool-time, nature walks, mini golf, arts’n’crafts, movies, Xbox, Nintento Wii and other tech-time fun. Aware that spa stays offer a good opportunity for mothers and grown daughters to bond, the Doral 33 treatments rooms and a full menu of spa services. The Doral is minutes away from Coconut Grove, Coral Gables, and South Beach. In short, whatever the age, it’s a desirable destination for traveling families. Double room rates range from $$-$$$ and up.